Glaucoma is one of the most common causes of blindness in the world — this prevalent eye disease affects over sixty billion people globally. Fortunately, advanced glaucoma treatment options are available to lower eye pressure and prevent glaucoma-related vision loss. Eye Physicians of Long Beach, CA is proud to offer the XEN® Gel Stent, a state-of-the-art, minimally invasive procedure for glaucoma patients. The XEN® Gel Stent has been shown to lower intraocular eye pressure and reduce the use of prescription medication in open-angle glaucoma patients. Keep reading to learn more. What is the XEN® Gel Stent? The XEN® Gel Stent is a small surgical implant designed for use in minimally invasive glaucoma surgery. The procedure helps drain fluid and reduce intraocular pressure (IOP) in open angle glaucoma patients, thus preserving vision. It is also referred to as aqueous shunt surgery. The XEN® Gel Stent is a small, tubular implant about the length of an eyelash. When placed just under the surface of the eye, the stent acts as a drainage device that channels fluid from the anterior chamber of the eye into an area called the subconjunctiva. As fluid leaves the eye, intraocular eye pressure is reduced. Lowering eye pressure levels can protect against optic nerve damage and permanent vision loss. How is the XEN® Gel Stent Different From Other Glaucoma Surgeries? 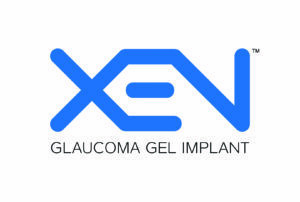 The XEN® Gel Stent is considered to be a hybrid between traditional glaucoma surgery, such as a tube shunt, laser trabeculoplasty, or trabeculectomy, and minimally invasive glaucoma surgery (MIGS). Many surgeons believe the procedure to be safer than traditional glaucoma surgeries because it takes less time to perform, is less invasive, involves a shorter recovery time, and results in fewer complications. Additionally, the XEN® Gel Stent procedure can be performed as a stand-alone procedure or at the same time as cataract surgery. The XEN® is also unique from other stents because it softens and becomes flexible when inserted into the eye. Another advantage is that it is made of non-silicone material, which can reduce inflammatory reactions and lower the risk of a blocked drainage system. First, your eye doctor will administer local or topical anesthesia, so you feel no pain. During surgery, your doctor will make a small incision on the surface of the eye. The XEN® Stent will then be inserted with an injector that is preloaded with the stent. Surgery typically takes 1 to 2 hours, and recovery is quick — most patients are back to their normal routine within a week or less. How Successful is the XEN® Gel Stent? In clinical trials, XEN reduced IOP in nearly all patients. The majority of participants did not require medications after 12 months of surgery, and most others had safe IOP ranges with reduced medicated eyedrops. Scarring of the bleb may decrease drainage. It is assumed that these patients require surgery because they have already been unsuccessful in using medicated eyedrops alone to manage eye pressure levels. Dr. Carlos Martinez was one of the first doctors to perform the XEN® Gel Stent procedure in Southern California. Dr. Martinez has also been elected as 1 of 20 surgeons by the board of the XEN® Gel Stent to provide input to better refine the procedure. He is also a Designated Physician Educator for other surgeons around the country. Looking for state-of-the-art glaucoma treatment in Long Beach, CA? At Eye Physicians of Long Beach, our team of eye care experts will meet with you to discuss your candidacy for the XEN® Gel Stent procedure. Contact us to schedule an appointment today!